Here is a list of best free KML viewer software for Windows. These software let you overlay KML files on maps. KML files display placemarks, paths, descriptions, ground overlays, and polygons on maps. These KML viewer software provide numerous features to let you view a map in detailed manner. Zoom feature is an important one, carried by all of these software. Some of these also let you calculate distance between two points or locations by pointing out locations on a map; distance is displayed in meters, centimeters, kilometers, etc. Go through this list of best free KML viewer software to know more about them. You will also get to know how to view KML files with these software. Google Earth stands as the best software to view KML files without any doubt. KML files were developed to be used with Google Earth. Opening a KML on Google Earth is as easy as it comes. It is a one of a kind software, available for free, and lets you view any part of Earth pretty easily. It relies on Internet to download map data. In case you have a KML file saved on your computer, you can load and view that as well, without the requirement of Internet. It has various other interesting features to offer; keep reading. The other mentioned software are as effective as Google Earth to view KML files, and are also good alternative to Google Earth. You can also check out these lists of Best Free IGS Viewer Software, Best Free EXIF Viewer Software, and Best Free CR2 Viewer Software. Google Earth, as cited before, is a one of a kind utility to view maps and terrains from all over the world. KML files are native to Google Earth and here you can easily open KML files stored on your computer. Its Zoom tool does the magic by allowing you to flawlessly zoom into maps up to street level. Drag the map around to navigate through map. Opening a KML file on Google Earth is not rocket science. To open a KML file, go to File>Open, locate your KML file and open it. As soon as you open your file, you will be able to view its contents on the map. The KML file that I have loaded here, consists of various cities pinned, along with flight routes. Google Earth has features that sets it class apart from other Earth browsers. To name a few, it flaunts 3D building viewing options, can access data from a GPS devices, and has a flight simulator. Not only it lets you view Earth, but you can view the Universe map (shot by Hubble), Mars, and Moon. If you have a KML file plotted for Moon, you can view it here as well. You can easily locate a place on the map using the search tool. View an area in different views including satellite view. It lets you find distance between two points as well. You can also view roads, building, and weather here. If you want to add your own placemark, path, polygon, model, or photo to map, you can do that as well. There are various files that can be loaded to Google Earth for different purposes. Add ETA, INI, Images, GPS data, Collada Model (.dae), etc. Marble is a free and open source World atlas, which works as good as Google Earth. 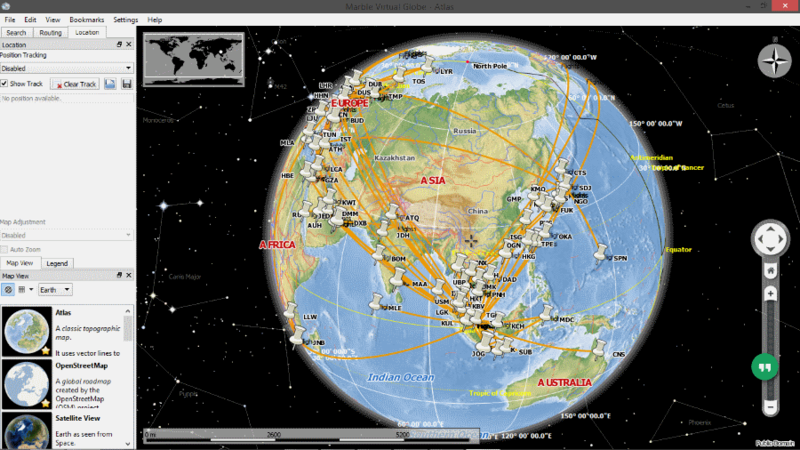 It is a virtual globe and gives you access to maps from all around the world. You can easily open KML here to view routes, placemarks, polygons, etc. on maps. You simply have to go to File>Open option to load a KML on map. Use the zoom tool for a magnified view of KML data and drag the map in any direction to navigate easily. Marble gets as extensive as it can get with all the features it packs. It lets you download maps of whole globe or a specific area for offline Earth browsing. It not only lets you export map as image and print map, but also lets you create a map. The viewing tools available are pretty amazing. View Atmospheric layer, Stars, Eclipses, Clouds, Compass, Elevation profile, Satellites, etc. or simply hide them selectively. Add bookmark, manage your bookmarks, record navigation as video, and do much more here. Along with KML and KMZ, it lets you load data in from of PN2, GPS data (.gpx), JSON, PNT, OSM, and LOG. GPS Prune is a free map viewing software specially designed to view GPS data and play around with it. Along with GPS data, you can also view KML files here. When you open a KML file, its data is displayed on a blank screen. Turn on the map by clicking on the Show Map button on the work-space. View placemarks, view tracks, connect track points, enable autopan for street view, view altitude, and much more. You can open both KML and KMZ files here, along with TXT and GPX files. Data from GPS devices can be moved to and fro. Various mapping options let you assign area geography parameters to locations. Tag photos and audio files to different locations if you want. All in all, its a simple but rich software, with lots of GPS options to play around with, and it displays KML data pretty neatly. KMLCSV Converter, as the name suggests, is primarily a KML to CSV converter. It converts KML files to CSV so that they can be loaded to and viewed on GPS devices. While you select a KML file to convert it to CSV, this software displays KML data. It has an integrated map over which you can view KML file data easily. You just have to select the folder containing your KML files. All the KML files from that folder are listed; select one to view it. You can choose to view KML in street view or satellite view. The KML file content are displayed on the map, and for each location-mark, their longitude and latitude is displayed. 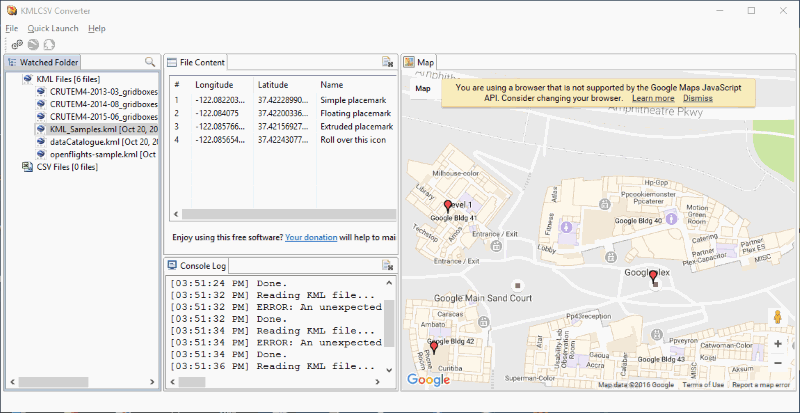 It has options to establish connection with Google Earth and Garmin POI loader. It also helps you to plot POIs through Google Maps and Google Earth. This cross platform KML viewer is available for Windows, Mac, and Linux.